I’ve written about the Educator as a Maker Educator. The activity for this week, week 2, we were asked to create circuit_boards (downloadable PDF). (plus some general others – tape, Stainless steel or copper nails, Philips head screws, Flat head screws, Coated wire, Zip ties, Soldering irons, Solder, Power drill screwdriver, Hammer, Saw, Sand paper, Wire cutter, Wire stripper). I am a teacher educator of mostly public school teachers and am attempting to get in the back into the classroom as a public school gifted educator. This material list would be fine for a maker space in, possibly, a museum or library, but not feasible in terms of costs in a public school classroom with up to 30 students. So I sought other ways to complete this week’s activity with my goal of learning circuit boards but on a budget. A characteristic of a Maker Educator is a resource provider that is feasible given the environment, the facilitators, and the learners. I found a few circuit building learning activities from the Museum of Science and Industry – Make a Circuit Board Quiz Board and Instructables –Build a Simple Circuit from a Pizza Box. 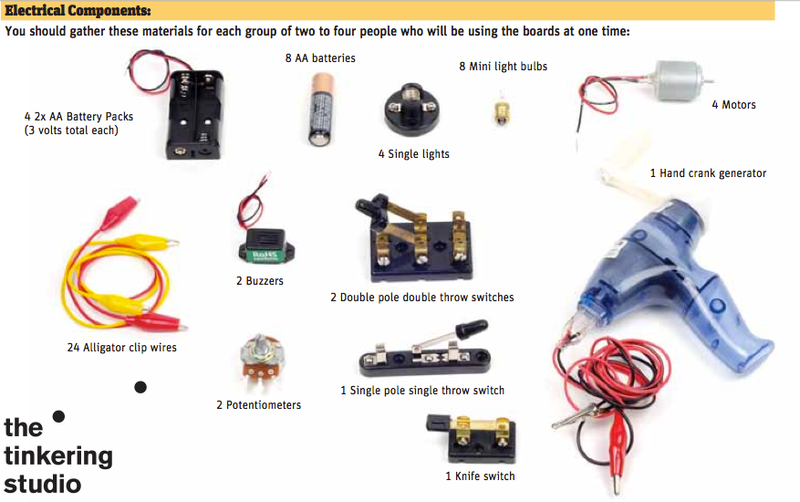 I already had the LED lights, the 3v battery and the metal brads; went out to purchase the paper clips, electrical tape, and decided to use foam core board instead of a pizza box (I don’t eat pizza); and set out to construct the circuit board as explained by the author of this activity. (FYI – the cost of this project would be less than $3.00 per student – the major costs being the LED lights and the battery). Quickly, I ran into problems. The paper clips didn’t have the conductivity needed for electrical current and I couldn’t make them “fit” as described in the directions. So that meant I needed to change my ideas and plans. I was failing at creating this circuit board, but understand that “Failure and iteration make everything better. In DIY and Maker culture, failure is expected and part of the fun” (http://www.gradhacker.org/2014/02/07/lessons-from-the-maker-movement). Based on this mindset, I made changes. I used craft wire instead of paper clips. I used a second LED instead of a buzzer (which I did not have), and cut out the sensor (which I also did not have). 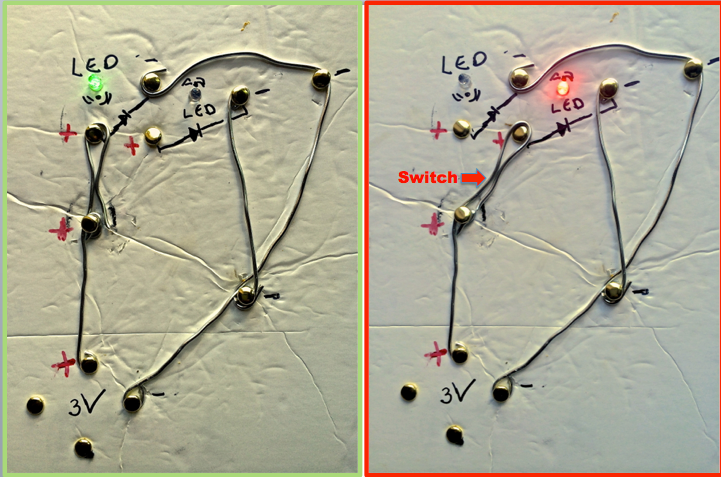 The result was a circuit board with two working LEDs and a switch to alternate which LED is lit – not pretty, looks quite different than the original but it works – not bad for someone who has never made or played with circuit boards. I got to experience the processes of creating, assessing, revising throughout this process. It was definitely about about the processes. Once I succeeded and took the pictures, I put the project in a closet as an example for my future students. The satisfaction came from the processes of creating, re-creating, assessing, reassessing, revising, and revising yet again. I have a belief that educators, me included, need to experience these processes personally in order to facilitate, model, and demonstrate them to their students. I used the directions I found on the Internet as a guide. I didn’t have any experience with creating a circuit board and needed to use some directions or tutorial as a form of scaffolding; to give me a foundation of skills to successfully complete the activity. This reinforces that some form of instruction is often required when introducing learners to new maker activities. The educator can provide direct instruction, video tutorials, or other learners as a means to give learners some basic foundational skills for the activities. Some learners have enough self-direction to seek out the resources on their own, but other learners, without the background experiences or scaffolding, may give up with frustration. Sidebar: I am a proponent of educators blogging, and have been promoting it even stronger than ever to other educators. This is my attempt to blog not only about my thoughts, resources, and philosophy, as I typically do, but also blog about my processes as an forever developing educator in order to share with and model this process for other educators.